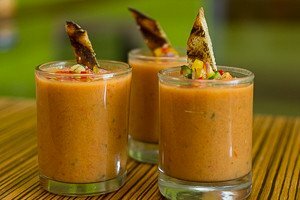 What do I love more about gazpacho? Eating it, or dreaming up ways to serve it? It’s a toss up! While I’m not kicking off a chilled bowl of gazpacho off the table any day, why stick with bowls when there are oh-so-many ways to enjoy this superlative soup, a veritable celebration of summer! How about hollowed-out bell peppers in yellow, orange and red? 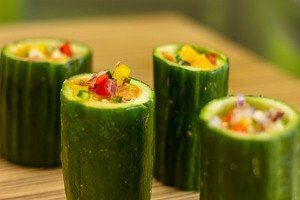 Or for those who love anything in miniature, hollowed out cucumber “shot glasses” are super-cute. Serves 6-12, depending on serving vessel. << Endless Summer Salads Class – rockin’ it with the knife!